While serious games often use computer-generated graphics to create 3-D environments, SIMmersion’s entirely new approach to serious games uses video scenes of people. This novel approach has placed the company’s HIITS game in the finals of the International Serious Games Showcase & Challenge Competition. I was pleasantly surprised that HIITS became a finalist in this international competition, because our gaming approach is so different. Traditional serious game technology is not designed to train difficult conversational skills, yet this type of training is particularly challenging and needs gaming engagement quality to be effective.” SIMmersion’s PeopleSim® gaming engine has advanced the serious games framework by making it possible to build games designed to have in-depth conversations or to train advanced conversational skills. Dr. Dale Olsen, SIMmersion’s CEO, says "I was pleasantly surprised that HIITS became a finalist in this international competition, because our gaming approach is so different." In the Hands-on Interview & Interrogation Training System (HIITS) game, the player’s goal is to solve a case of stolen classified documents by talking with a suspect named Jennifer Lerner. Getting a confession requires players to apply advanced interview techniques to determine if she is guilty and if she is, to then get a confession. Each attempt can take well over an hour and can be a challenge for even highly-experienced police officers. Players can only complete the game and get a certificate when they have gotten five different confessions, each using different specialized techniques tailored to a specific guilty version of Jennifer. Interrogation techniques are complex and difficult to learn. Investigative mistakes can let criminals go free or result in the prosecution of innocent people. 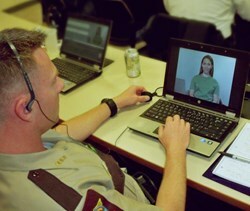 Research on SIMmersion’s HIITS has been shown to help police officers master this skill. Officers love playing this educational game and have reported working through the night to get the required confessions. Gaming principles are used to make the practice required to develop skills fun and more effective, by drawing the learner into an immersive experience. HIITS provides the engaging realism trainees need in ways that other non-gaming forms of training rarely can achieve. For training purposes, HIITS surpasses real investigative experiences by creating more teachable moments and providing essential feedback that is not available during actual investigations. Yet HIITS maintains sufficient realism so that, like in a movie, the trainee feels that the Jennifer and the experiences are real. SIMmersion’s PeopleSim® level 4 interactive games and training systems can now be delivered as a SCORM-compliant web-based application, on DVDs, and most recently through mobile platforms like smart phones. These systems can be made 508 compliant. Professional actors are used to create life-like, challenging situations. Each simulated character has memory and an advanced emotional model that allows the character to respond to the user’s statements as a real person would. The result is a nearly freeform conversation that is different each time the simulation is used. The Serious Games Showcase and Challenge is an international competition held during the Interservice/Industry Training, Simulation and Education Conference (I/ITSEC) in Orlando, FL. SIMmersion’s HIITS is a finalist for the highly-competitive “Business” category, and is eligible for the Best Business Game and People’s Choice awards. Awards will be announced at the conference on Thursday, December 5th. For more information, contact SIMmersion online or call at 443-283-2555. 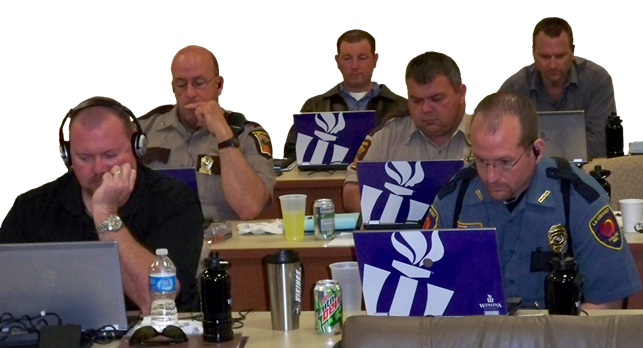 One-Page Description HIITS as a Training System HIITS Logo Police Officers use HIITSOfficers stay engaged as the class the class draws to a close at the end of the third day.